A win, four different scorers and the emergence of what looks to be a talent of strong potential was a fine way for Hearts to round off last week’s pre-season tour of Ireland in the Belfast sunshine. 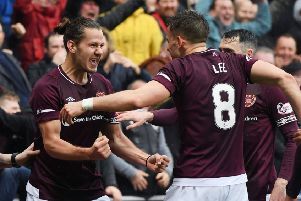 The 4-1 victory over Linfield – who now face the daunting prospect of Celtic in their Champions League second qualifying round – was straightforward, but still impressive as Hearts dominated. With constant width from wing-backs Michael Smith and Rafal Grzelak and a fluid front three of Jamie Walker, Esmael Goncalves and Kyle Lafferty, there is a clearer sense of how Ian Cathro wants his rebuilt Hearts team to function. The addition of Christophe Berra, who has taken charge of the back three, may just be the vital foundation on which they can build. Understandably, the prominence of 16-year-old Harry Cochrane has given fans cause for optimism. The young midfielder turned in a man-of-the-match performance in the middle of the park, netting his first senior goal to cancel out Jamie Mulgrew’s opener in the process. Given his age, Cochrane is clearly some way off from being able to compete physically, but his vision, range of passing and ability on the ball is there for all to see. Cathro was keen not to overstate Cochrane’s impact with his career still in its infancy, but admitted he’d have no fears over giving him game-time next season. “He’s a talented kid,” said the Hearts boss. “The important things is, you’ve seen us add Christophe Berra, you’ve seen us Kyle Lafferty, you’ve seen us Rafal [Grzelak], you’ve seen us add Cole Stockton – he’s a different type ... in a short period of time the ball goes in the goal with Cole. “Then you also see young players coming through. It’s about getting the right balance at this club, which is important. We want to support the young players and give them opportunities when the time is right. “We have to be calm with those things, but I’m not scored by the fact that a player’s 16, 17 or 18. Harry’s a talent and we need to support him, but also our young talents like Jamie Brandon and Rory Currie, who have all previously had experience. Euan Henderson came on in the last game of the season at Celtic Park and did remarkably well. Jamie Walker’s return to the scoresheet and subsequent performance will also please the Tynecastle faithful. Turning down a contract offer earlier in the year, combined with two failed bids from Rangers this summer, haven’t made this the easiest spell for the 24-year-old. The reception he received from the 250 travelling Jambos inside the impressive Windsor Park was overwhelmingly positive, however, with “One Jamie Walker” ringing out form the lower tier of the South Stand as the match kicked off. Walker nodding in Don Cowie’s corner to put Hearts 2-1 up didn’t do any harm either and the attacking midfielder remained a threat to David Healy’s side all afternoon. Goal of the game however, came from Goncalves. Receiving the ball to feet from Prince Buaben, he rolled his man before dispatching a stylish finish beyond Roy Carroll and looks like he’s picked up where he left off last season when he notched seven goals in half-a-season since signing in January. Stockton came off the bench to net a late fourth – his second in three pre-season games – prompting those in maroon in to a chorus of “We want five”. The goals, performance and afternoon in general was a satisfying one for Cathro. “It was a positive day overall,” he said. “I think it’s probably the first time we’ve started to piece some of the parts together knowing we don’t have as long to get ready as normal. “We’ve got our first competitive game on July 19, which isn’t far from now, so we’re challenging them everyday to try and push a little bit quicker that what would maybe be normal. Physically it was a reasonably calm game, so we don’t have any issues there. “Time helps give that understanding. Time for the new players that we’ve got to get together, to work with each other and we’re positive and excited about that. Linfield manager Healy was grateful for the opportunity to test themselves against a top-end Scottish team ahead of Celtic’s visit in the Champions League this Friday. “It was a good work out,” said Northern Ireland’s all-time record scorer. “Hearts are a good side with good players. They try and play the right way and our boys aren’t used to the standard and level that Hearts play at, and the pace and tempo they play at. The movement too – probably more than anything it’s that movement we don’t have.